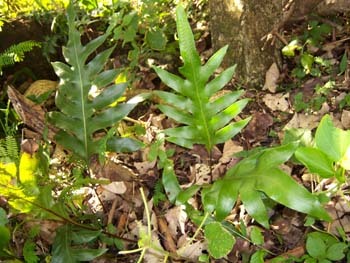 The serpent or wart fern can be found from Africa to Southeast Asia and to Australia. 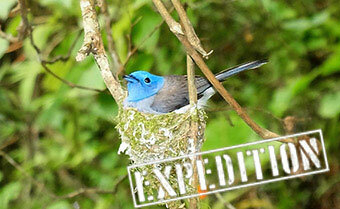 It covers the ground, climbs on rocks, up the sides of trees and palms, and will grow on old stone or brick walls. Usually close to the ocean. As the sori develop on the underside of the fronds, they cause pumps to appear on the upper surface of the frond, this is where the fern gets its name 'Wart fern'. These ferns are members of the Polypodiaceae, the many-footed fern family which is where this fern gets its 'serpent' name. The feet or rhizomes vaguely resemble little green snakes. Wart fern is easy to cultivate and makes an outstanding plant for a hanging basket; the green rhizomes curl around the outer side of the basket. The fronds arise from the rhizomes. Eventually the entire basket becomes an elegant sphere of shiny green fronds.